3 of my grandkids had a blast sledding over the Christmas holiday this year! Even grandma had to take a turn much to the delight of the kids (bottom right). 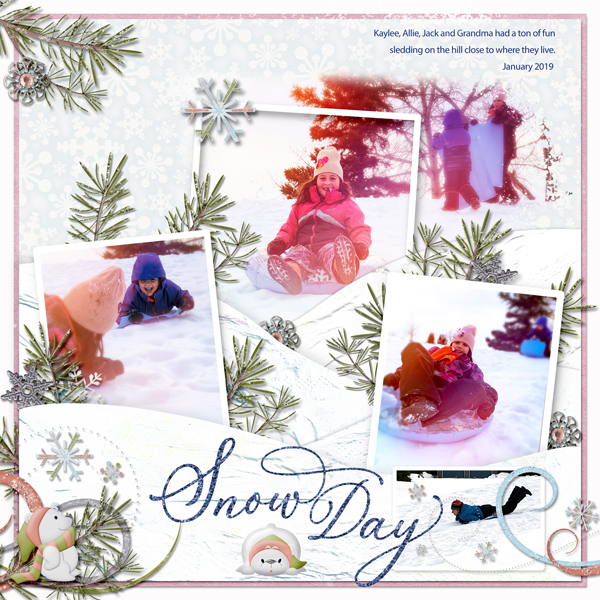 Kit =Snow Bears by Kits4Kids (Kristmess Designs and Kathryn Estry. 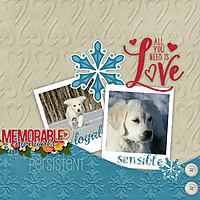 oh and I used a gesso texture overlayed on the snow. I love the way that you created the hills and have the photos coming out from behind them. Great use of the pine boughs as well. Truly beautiful page. What a fun page. Love the photos, framing, and snow hills. Super! Love the framing technique of the center blended photo. I like the pairing of the whiteness in the photos with the whiteness of the background and the way the pine sprigs separate the them adding dimension to the page. Love your page! I like how you placed the photos and the frames so that everything looks like a large photo. Very cleverly done. I also like the spruce twigs behind the photos. 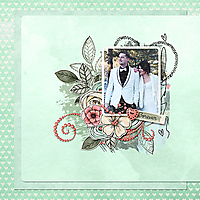 I really like the way that you've done the masking on your page and the use of the pieces of evergreen on your page is really nice.